In the challenging choice between the proven and the new, only those who focus on their core competencies and allow themselves to be driven by the market are successful. Not only a look at the history books, but also the outlook for the future demonstrates that SSM has always considered this challenging choice as an incentive for innovative solutions. Jean Schweiter and Heinrich Schrader build one of the first mechanical pirn winders. Almost 40 years later, Jean Schweiter takes over the workshop and runs it as a mechanical engineering factory. Jean Schweiter and his company win global recognition in the textile world with his invention of the horizontal spindle replacement. Foundation of Schweiter AG and registration in the commercial register. New building for Schweiter in Horgen Oberdorf. Schweiter ist listed on the Swiss Stock Exchange. Step precision winding, developed by Schweiter in the 1970s and registered in1984, combines the advantages of random winding and precision winding. The ratio between double strokes and number of revolutions is kept constant for a certain diameter range. The crossing angle varies only slightly within a range of ±1°. This results in an enhanced package density that does not change with increasing package diameter. So the building of pattern zones is avoided and the package maintains a stable structure without any ribbons. Due to this stable structure, the risk of complete layers “slipping off” during the unwinding process of dyed packages, as known with random winding, is completely eliminated. Hans Widmer takes over the majority of Schweiter shares. Establishement of SSM AG by merger of the three companies Schärer, Schweiter and Mettler. In the same year, Schweiter Technologies is established as a holding company. Traversing system with separate drives for the spindle and the traverse motion. Traverse length and lay spacing are infinitely adjustable and set by entering the corresponding parameters into a central terminal. The groove drum winding machine from SSM with creative design and reduction to the necessary - the winding system ClassicWind™ delivers a competitive edge that is hard to beat. Acquisition of the German companies Stähle Eltex in Reutlingen and Hacoba Spultechnik in Wuppertal. Provides the customer the full control over the winding tension independent of the quality of the supply material or the chosen winding speed. The active working digitens™ system does not only allow to monitor the winding tension and give an controlled increase or decrease to the winding tension thus leading to higher production speeds and efficiency of the equipment. The slub yarn device enables random or periodic flames with thick and/or thin places in the yarn can be produced directly on individual or assembled yarns. Such effect yarns can be produced on air-texturing machines or anywhere you need to vary yarn tension to create a fancy-effect yarn. The flame and random effect in the yarn is controlled through a lifting device with a pull- and an over feeding phase. These yarns are applied in a variety of applications such as curtains, ladies wear, furniture fabrics etc. With improved performance is an evolution of the unique SSM traverse technology. 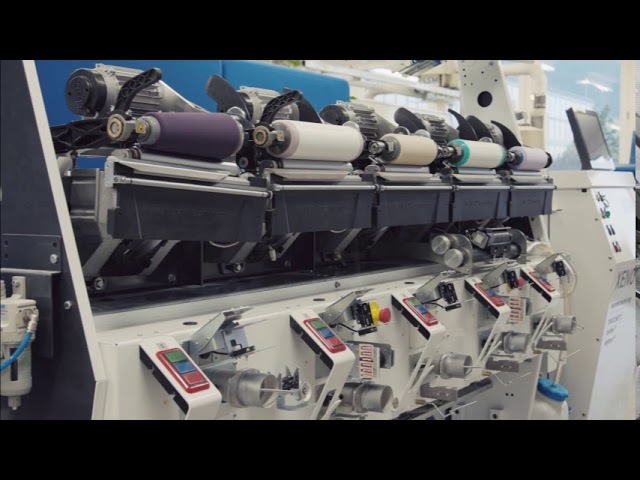 While alternative electronic yarn guide systems from other suppliers do not yet achieve the 1995 performance level of preciflex™, fastflex™ steps into the next generation with a performance increase of about 50 %. Therefore, any type of material may be processed at maximum level of productivity. It allows a highly precise and controlled hot or cold application of lubricant to the yarn surface. Temperatures up to 95 °C, gear pump with 0.3–15 g/min. capacity per spindle position, and other parameters can be set directly at the lubrication device or through the central terminal. The lubricant is applied to the yarn surface through special dispensing pads. One mixing tank delivers lubricant to max. 20 spindles. The gear pump delivers proportional to the thread winding speed. Opening of SSM Zhongshan, China. With the jet processed online monitored yarn quality system, SSM has overcome the problems in quality control of the air texturing process and offers now an overall solution for the production of ATY of all different types. The idea of this concept to collect all data of the texturing process and analyse the fluctuation of the parameters. Certain combinations of fluctuations will indicate the major defects in the texturing process. For the supervisor of the production it is very important, that the settings for the system are made very easily and also the monitoring of the quality will just indicated by red lights. Additionally the machine position will stop when defined quality parameters are out of range. The position of the final wraps then also indicate the grade of the quality. Designed to maintain a lower and quasi-constant yarn tension on the feed package in the rewinding process. This innovation comprises a variable distance between the top of the feed package and the first thread guide in relation to the feed package diameter. By doing so, the yarn balloon remains constantly single and the yarn off-wind tension remains practically constant along the entire length of the feed package. Asymmetric winding from right to left, the asymmetry varying with the diameter of the package. The result is a better unwinding performance of winding packages for weaving applications by constant unwinding speed over head, the detaching point (balloon) rotates with variable speeds. Acquisition of the Italian company Giudici S.p.A. in Galbiate. It is based on the patent pending technology of XRCT (x-ray computed tomography) for yarn bobbins. For every producer of dye packages it is essential to maintain a homogenous density in their final products. Until now the techniques of analysing the density were rudimentary. With x-view™ SSM offers a cutting-edge service for its customers. The precise analysis reveals the inner quality of the product. The introduction of the XENO platform opened new possibilities for optimizing the winding algorithm. Thanks to this new machine platform, SSM could release DIGICONE® 2, enabling an increase of dye package density by another 10-24% with unchanged dyeing recipes. On June 30, 2017, Rieter acquired the SSM Textile Machinery Division (SSM) from Schweiter Technologies AG, Horgen (Switzerland). Rieter is the world’s leading supplier of systems for short-staple fiber spinning. Based in Winterthur (Switzerland), the company develops and manufactures machinery, systems and components used to convert natural and manmade fibers and their blends into yarns. Rieter is the only supplier worldwide to cover spinning preparation processes as well as all four end spinning processes currently established on the market. With 15 manufacturing locations in nine countries, the company employs a global workforce of some 5 020, about 20% of whom are based in Switzerland. Rieter is listed on the SIX Swiss Exchange under ticker symbol RIEN.